Audi's success over the last few years has been meteoric. 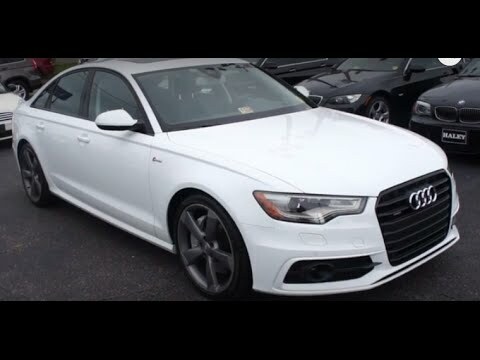 A number of recently redesigned models have broken new ground in the areas of styling, performance and interior design, including the 2014 A6 and its performance twin the 2014 Audi S6. With rivals BMW and Mercedes-Benz squarely in its sites, Audi is making its presence known. I love the my Audi. It has comfort features unlike other mid size luxury cars. I enjoy the interior size of the Audi a6. It has large seats and still enough leg room for 3 adults in the back seat. The truck is unusually large for this size car also. It features navigation, Bluetooth, rear view camera. I like that the navigation once your destination is entered shows up on the dash for ease of reading the map with driving. It has great gas mileage and a lot of pep for a 4 cylinder. That it's a very fast car has a very nice engine. It's a gas hog but other than that very luxurious. , very comfortable ride and very nice inside and out no complaints. Has a very strong and smooth motor and just purrs just the way it's supposed to couldn't ask for a better vehicle. It has all the latest features in it all digital and voice control automatic start and everything. Luxury & reliability combined to create a beautiful, timeless sedan. Feels luxurious from the way it drives to seating and features. Comfort. Reliable in the technology built-in to tell driver when car needs something, never have to wonder before a road trip. Trunk space sufficient, especially for a car. Heated seats are great for back support and chilly mornings!